Blog - Can vinyl lettering be defective?? 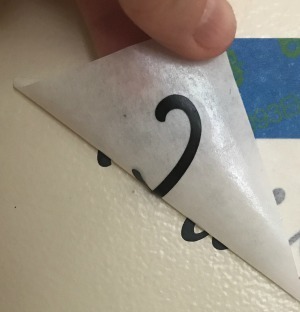 Can vinyl lettering be defective?? So could your lettering be defective? Of course it is possible... but not probable. If you got your lettering at the dollar store, odds are it was made with some really inexpensive materials. And you might have a heck of a time installing it. And even if it does stick, it might fall off the wall in the future. Seriously... that is not a joke. That old saying 'you get what you pay for' applies to vinyl. * Did you clean the wall off first and let it completely dry? Sure, most walls 'look' clean. But there is almost always dust there. Always. And dust will hinder your stick-ability factor. 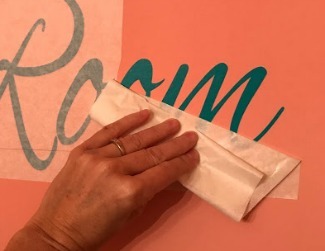 * After you removed the glossy paper backing and smoothed the masking (and lettering) to the wall, did you go over it again to ensure you had a good bond? It doesn't take much. Just take your widget and go back over the whole thing. The masking is only slightly sticky - the vinyl is super sticky. So you aren't going to over stick anything. * Have you painted lately? Weird but true. New paint sometimes won't let anything stick to it. I can't really explain why. And it's not every brand. But I have definitely run into this problem in the past. * Is your vinyl lettering older than 60 days? Because if it is, the vinyl and the masking have become more married and will be tougher to separate. It's still definitely doable. But be prepared to be slightly frustrated in this installation haha..
And listen, even if none of these apply, you still might run into this situation to some slight degree. But not to worry - it is still possible! It will take longer, and you will have to go much (and I mean MUCH) slower, but you can still get your vinyl installed if you possess enough patience to work through it. If it comes up/off with the masking, just lay it back agaist the wall and rub a little more with your widget on the outside of the masking while you're are slowly peeling it back. It's almost like you are feeding it to the wall. Because all you really need is for one end of the lettering/shape to stick and the rest of it will follow suit. As always, we are right here, ready to help when you need it.